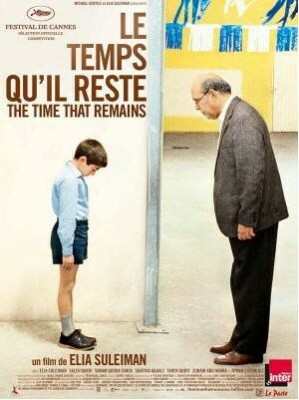 Yesterday I saw Elia Suleiman's latest, "The Time that Remains," at the European Film Festival at CityStars (the festival runs through Tuesday), and really enjoyed it--better than his last, "Divine Intervention." The film chronicles Suleiman's own family's experience of the Nakbah and the Israeli occupation of Nazareth, up to the present. It's largely filmed in the house he grew up in, and based on interviews he conducted with his dying father. It is a very touching tribute to his parents, among other things. The film has Suleiman's typically deadpan humour (a foul-mouthed, alcoholic neighbour who--ever since getting a job at a gas station, and hence access to copious amounts of gasoline--regularly threatens to set himself on fire; a school principle who scolds the young Suleiman: "Who told you America is Imperialist?"). But it's dominated by sounds and silence, more than dialogue, by wittily orchestrated scenes, poignant and hilarious visual gags. Rendering Palestinian history as a stripped down, stylized tragi-comedy, a series of personal/historical vignettes, turns out to be particularly effective. There is a great attention to visual and auditory details, which accumulate to create increasingly moving patterns and rhythms. For me the film faltered a little in its third half, when Suleiman himself entered the scene. The way he acts--as a cardboard cutout of himself, basically--suggests his total alienation, his current position as a "mute observer," as one critic observes, but is also so disaffected it drains the scenes of any emotion. His take on contemporary Palestine--as opposed to that of his childhood--also seemed less specific and original. But it is a fascinating, moving, witty film. Here is a nice round-up of critical reactions. Suleiman was also on hand afterwards for a question and answer session. He noted that for him every time he can remove dialogue from the story it's a "victory," because silence is the most troubling thing for power--"even words of opposition comfort power," whereas "silence frightens it." He also mentioned that he had to get permission to use an Israeli tank for the film and that, ironically, the the only part of the film the Israeli authorities objected to was the scene in which Israeli soldiers rob a Palestinian house (there are more serious crimes committed). They also wanted a thanks in the film credits for letting him use the tank--now that sounds like something out of one of his films.